With high heat dissipation metal on board, you can charge multiple high-powered devices without fear of overheating the adapter even if the charging process takes a considerable amount of time. The unit is quite heavy (might not be suitable for air travel). If you are looking for a reliable combo model of an adapter and converter for high-power devices (hair fans, flat irons etc) this is a go-to pick for you. This adapter is capable of enduring a prolonged charging with a total output of 2000 Watts. 2.1" x 1.96" x 4.3"
The housing of this model is made of flame retardant plastic that prevents overheating. 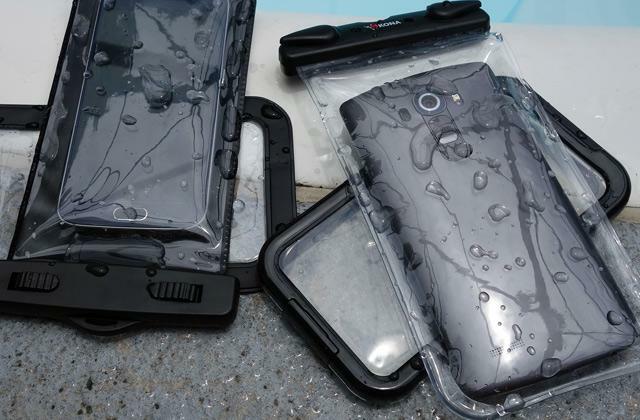 On top of that, the material is highly durable and ensures a long service life. The USB ports are a bit too close to each other. 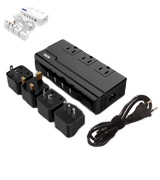 This is a 220V to 110V adapter with plugs that is reliable and can be used in over 150 countries around the globe. 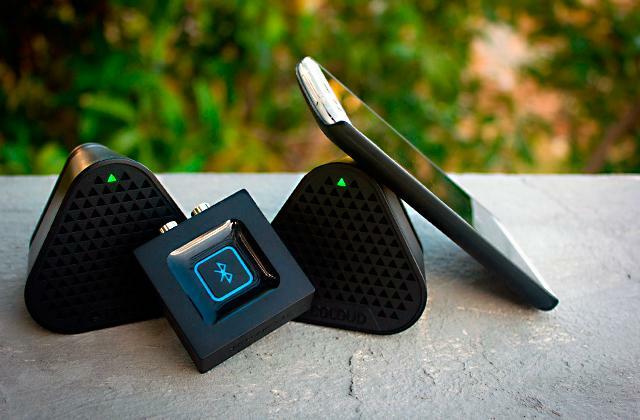 On top of the regular prong plugs, the device is equipped with 4 USB ports for charging mobile appliances. These factors alone make this model a worthy pick. 4.8" x 3.1" x 1.5"
The input voltage of this model can fluctuate from 90V to 260V, which makes it applicable in many countries. The converter mode offers a stable voltage of 110 V even if the electrical circuit is not stable. The bright white body stains easily. 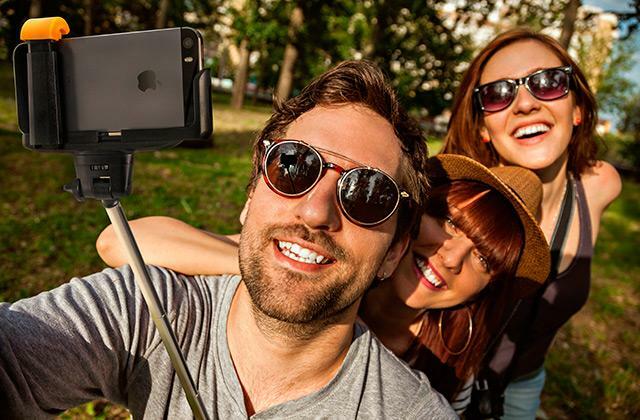 This affordable and reliable converter from BESTEK is a must-have for travelers that spend countless days on the road and rely on a big number of mobile gadgets. 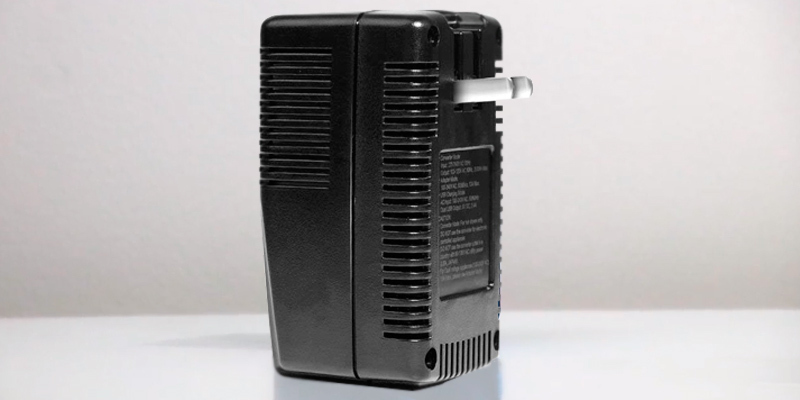 By utilizing this model you will be able to charge up to seven 200-Watt devices simultaneously. 6" x 3" x 1.6"
The safety lock system allows storing the voltage transformer with plug prongs folded, which provides you with additional space inside your luggage case or bag. The model only allows for one plug at a time. The main selling point of this model is its portability that can be extended even more by folding down the actual plug prongs. 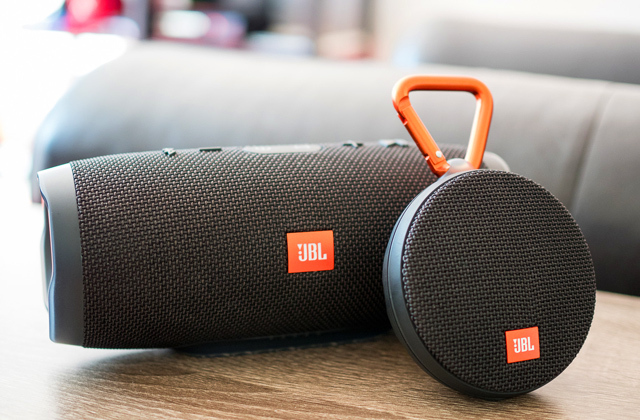 The device is so small it can fit inside the pocket of your bag or even a jacket so it's a go-to pick for those who can't bring too much luggage on the airplane. 2.8" x 2.5" x 2.3"
The 4 Type-C USB ports have an output current of 2.4A each so you can charge 4 different mobile gadgets simultaneously in a matter of minutes. The ports are located far away from each so there's plenty of room for large USB adapters and cables. A bit louder than most models due to the cooler. 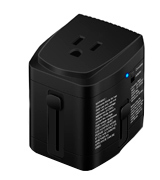 Regardless of the point of your destination, with this converter model from THZY you will be able to charge all of your electric travel appliances and gadgets. 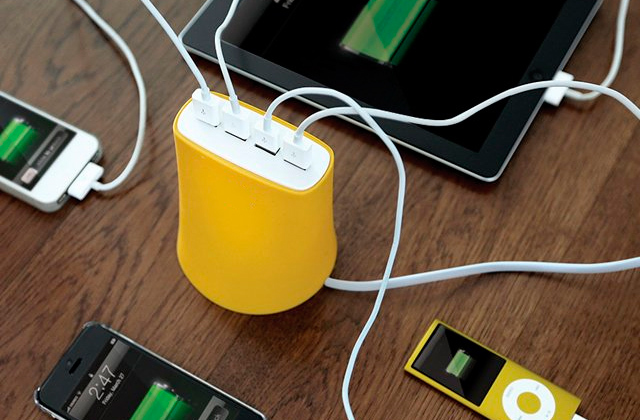 Its 3 plugs and 4 USB ports will ensure that none of your gadgets will be left with a flat battery. 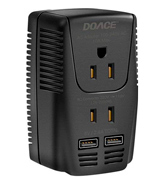 An upgraded 2018 version of DOACE C11 features 3 types of powering your electric devices regardless of the country you are going to visit. Thanks to the special adapters that come supplied with the appliance you will be able to travel to countries of the European Union (including Italy), United Kingdom, Australia, and New Zealand without the need to take along a huge portable battery. The voltage converter itself is capable of transforming the voltage from 220 to 110 volts, which will be a real lifesaver if you are staying in a country with 220-volt electrical outlets. The only thing you should remember when utilizing the device, though, is that you can only use a 2-pin socket in order to connect your 100V-powered devices. Use the converter mode with other dual voltage prong plugs that come together with the main adapter. Other than that, the device is protected from electrical surges and overcharging, which makes this model great for gadgets and devices that use heating elements (hair dryers, flat irons, and similar). This model from DOACE will be your go to pick if you need a practical, light, and portable converter and adapter in one package. 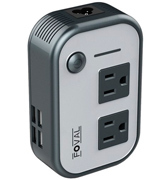 Unlike many other similar products, this model from Foval Power is capable of charging not only one device but two at the same time, thanks to its dual 2-pin sockets. On top of that, the power converter has 4 USB ports so you can charge 4 mobile gadgets simultaneously. Moreover, each of the four USB ports has a power output of 2.4A so you will be able to reach full charge in a matter of a few hours. 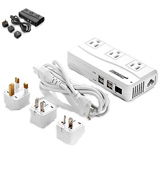 As for the means of connectivity to the power outlets, the kit features 3 prong adapters for international travel that include US to UK plug adapter, AU plug, and a power cable with a Euro plug for your perfect Euro tour. In case you are going to visit the Middle East or Africa, you will be happy to know that power sockets in countries such as Israel and Lebanon accept Type C (Euro) plugs as well, even though their sockets feature holes for 3 prongs. 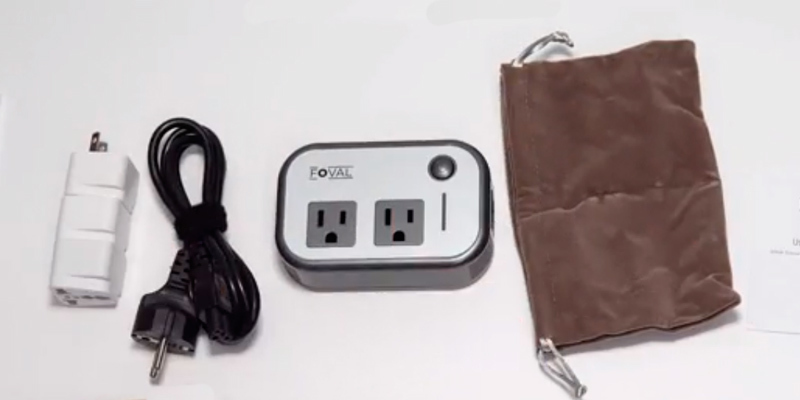 No bigger than a passport, this Foval Power outlet converter can fit almost any pocket in your bag, backpack, or luggage case with ease. Perfect for traveling across the globe or as a stationary charging device if you are going to stay in a foreign country for a while, the voltage converter from Foval Power is efficient and affordable enough to be a must-have model. A universal converter of voltage from BESTEK has all it takes to be an all-around good product. But what makes this model stand out from the crowd of similar adapter converters? Let’s take a glance at its key aspects and find out, shall we? First things first, the device features 3 Type B sockets and one input socket for a power cable. Additionally, this converter is equipped with 4 USB ports (two 2.4 A and two 1 A), which rounds up into 6 A of total power output dedicated specifically for mobile gadgets. 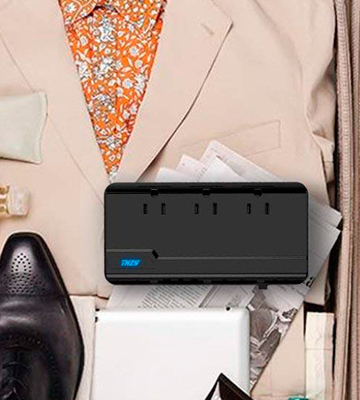 With 7 ports in total, you can find a spot for any and all gadgets in your luggage. Tested by NRTL (Nationally Recognized Testing Laboratory), the step down voltage converter meets all the requirements of various industries and can be used beyond the mere needs of traveling and this alone says a lot about the protection means of this model. 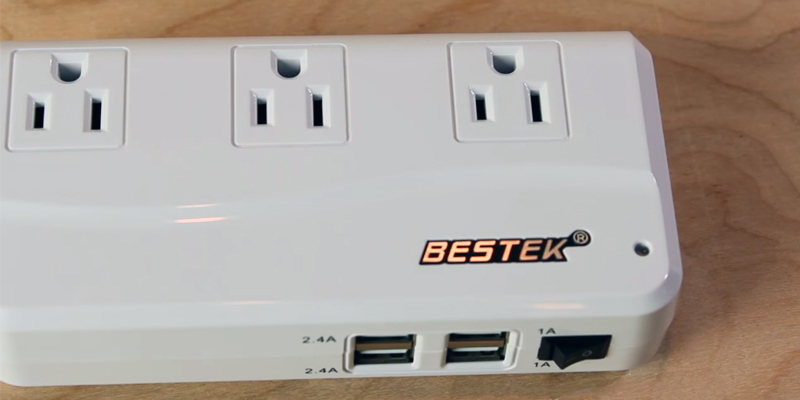 To be more precise, this adapter from BESTEK has a supreme protection system that will cover your devices in case of a voltage jump, electric discharge, or if the adapter gets too hot. 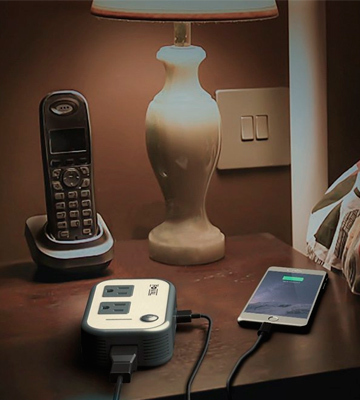 An essential portable charging device that will come in handy more than once during your countless trips across foreign countries. 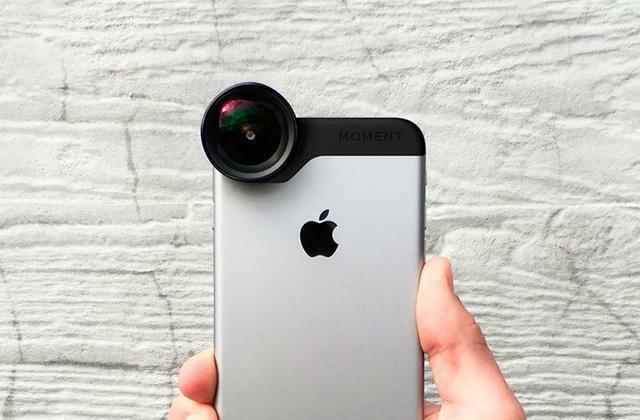 The only thing that is noticeable during use is the bright white color of the housing that stains quite easily. However, if you are not discouraged by this impractical yet not really crucial flaw then, this model will be right up your alley, especially since it doesn’t affect performance one bit. This Bonazza travel adapter is capable of converting the voltage from dangerous 220v to 110v with an output wattage of 2000W. Thus it is designed to accommodate the needs of users with high-wattage electric appliances. 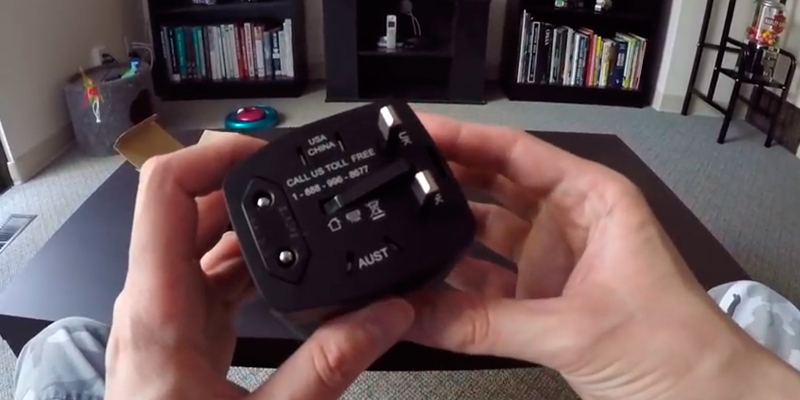 Despite its modest appearance, the device is capable of delivering dual voltage if switched to adapter mode, which is quite handy in case you need to connect your flat iron or hair dryer. 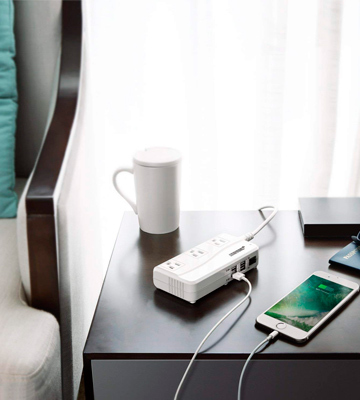 You will be able to do so in the motels, hotels or virtually anywhere as long as these rooms feature Type B, Type C, Type D, and Type I power sockets. 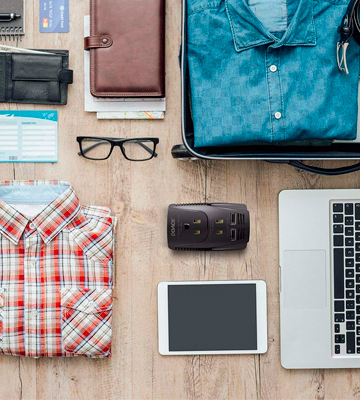 Wherever you want to go, from Israel to India and Japan, you will be provided with everything you need with this handy adapter in your bag. 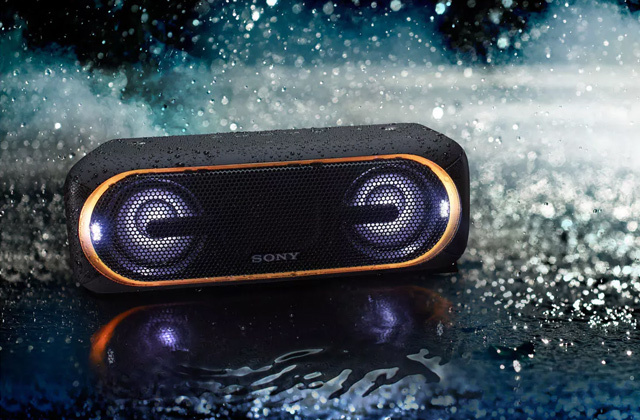 As for the convenience and portability of the product, there is one thing that makes this model unique. A special latch on the side of the housing allows you to hide the metal prongs of the adapter inside its body. By hiding the prongs, you nullify the risk of breaking or damaging them. All in all, if you are searching for a basic model that is capable of producing enough power to charge all of your travel gear - look no further. From a mobile phone to a laptop and shaving razor, this model from Bonazza will keep your gadgets juiced up in over 150 countries. The voltage and current converter from THZY is quite universal when it comes to portability and ease of use. On top of regular functions such as converting the voltage as well as the current, the model is not too loud for a 200-watt product. This is achieved thanks to a low-power yet highly effective internal fan that is directed at the transformer of voltage within the housing of the device. With this tiny element on board, you can be sure that the converter won’t overheat even if you are charging multiple devices at the same time. It's still a bit louder than most converters but it's a small compromise for the sake of power. 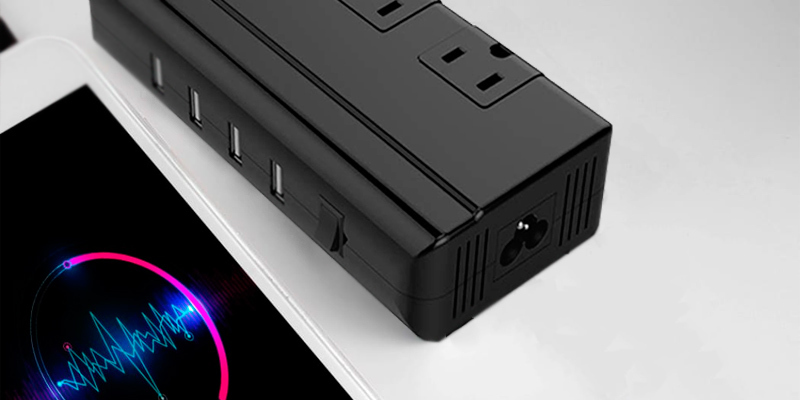 Speaking of connection means, the device has 3 electrical outlets that can be used simultaneously. Moreover, unlike other similar models within the same price range, the THZY step down adapter has 4 USB ports that have a total power output of 8 amperes (2.1 A each). 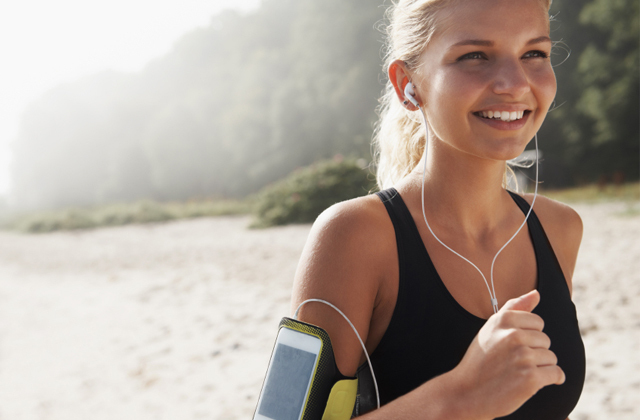 These four outputs will definitely come in handy in case you own more than one device or if you are traveling with family members or friends. Additionally, the kit includes prong adapters that are compatible with power sockets in many countries across the European Union, UK, Asia, and Oceania. 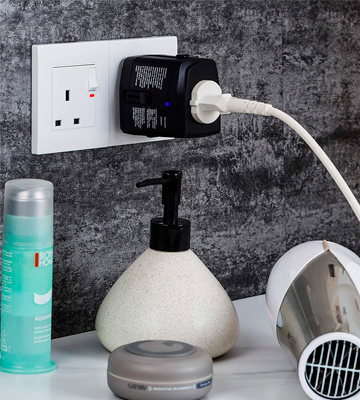 To wrap things up, the universal travel adapter from THZY is a budget-friendly solution to all the problems with the electrical socket of any kind. When your appliances are mostly powered by 110-volt outlets and power sources it can be quite challenging to juice up all of them once you end up in a foreign country. 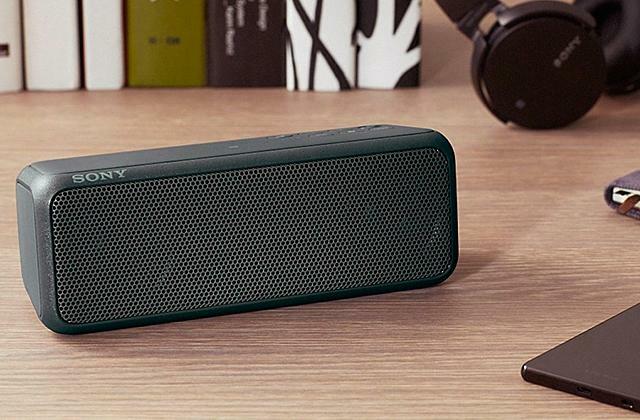 If you try doing so, the device might get damaged, electrocuted, or it might even blow up as it charges. Suffice to say that you don’t want that. So, what is the solution to this problem? A good power converter is all you really need in this case. In addition to being light, compact, and portable, these modern products feature an array of different handy features such as the ability to switch adapters according to the electrical outlets in a specific country. Since the device is capable of transforming the voltage from 220V to 110V, you won’t need a bulky potential (voltage) transformer in order to charge all of your devices. Likewise, there are dual voltage models available on the market. 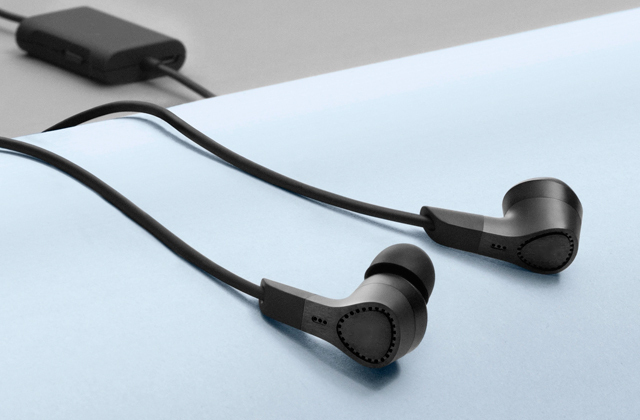 With these in your bag, you will be able to charge and use multiple devices at the same time. Moreover, you can change the voltage from 110V to 220V in the blink of an eye. Some converter models are even equipped with USB ports so you can power up your phone or tablet while using a hair dryer or hair straightener, for example. In case you are searching for more travel gear to power up your electrical appliances we recommend taking a look at our power banks reviews. 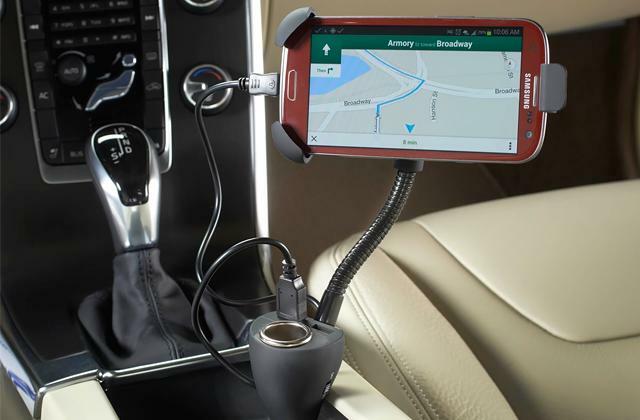 Alternatively, if you are going for a cross-country road trip, you may be interested in car chargers as well.